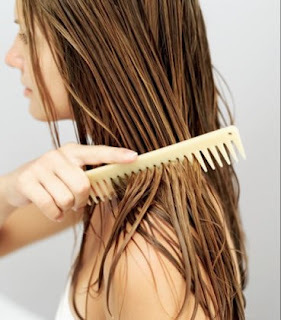 Babblings of a Mommy: Beauty Tip Of The Day: Getting Rid Of Greasy Hair. Beauty Tip Of The Day: Getting Rid Of Greasy Hair. "Meet your new best hair friend: dry shampoo. Sprinkle or spray some on your roots, massage it in and watch the grease disappear (try Klorane ECO Gentle Dry Shampoo with Oat Milk, $18). If you're out of dry shampoo or don't own any, use baby powder, just make sure to really work it in so you don't have dusty-looking white roots. And if you're out of both those things? Then make the grease look intentional by slicking all of your hair back into a sleek ponytail -- and maybe spritz some perfume over it to cover the smell." I manage to get a shower in every night, but this would be sooo handy for those times when I'm just way way too tired! LOL!! Definitely! It will definitely make your life a lot easier. I have greasy, nasty hair. I *thought* I had to wash my hair every day until my hair dresser chastised me and told me the reason I have such greasy hair is because I wash it every day. She says I wash out all the natural oils. Her suggestion? Dry Shampoo. She said if I go a month washing it every other day and using dry shampoo or baby powder, the health of my hair would improve and I wouldn't need to wash it every day.